1. 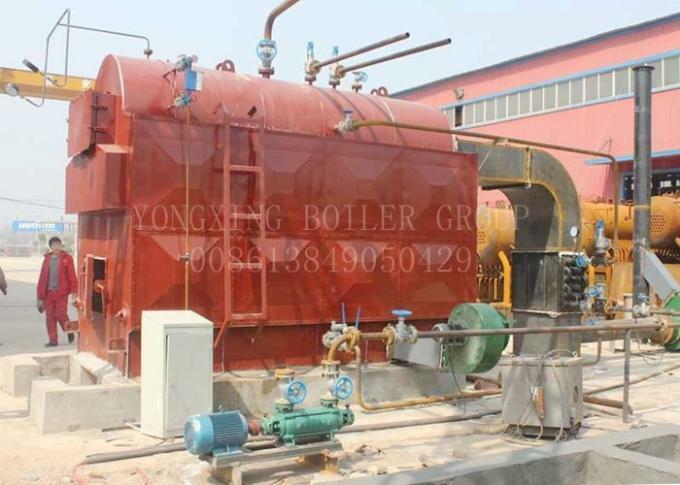 The DZL biomass fast-loading chain grate boiler produced by the company adopts the "two-wing flue technology" as the core technology, and successfully solves the problem that the bottom of the drum tube which exists in the fast-loading chain grate boiler is easy to produce the bulge and high-temperature zone tube plate. 2. Two technical problems that are prone to cracks have become the benchmark for a new generation of water-fire tube quick-loading chain grate boilers. 3. The combustion process can be briefly described as follows: the biomass fuel is sent to the furnace by the screw feeder, where it is gradually preheated due to the action of high temperature flue gas and primary air, drying, igniting, burning, and a large amount of volatile components are precipitated in the process. 4. The main heated surface of the boiler is subjected to a large amount of high temperature flue gas. 5. These flue gas enters the economizer and air preheater at the end of the boiler, enters the dust collector, and is finally discharged into the atmosphere through the chimney. 1). Feeding system. It is mainly composed of feed bin, vibrating feeder, screw feeder, spiral feeding pipe, etc. 2). Combustion system. Mainly composed of burners, fans, igniters, etc. 3). Ash removal system. The boiler's ash removal system can regularly clean the furnace and the smoke pipe to ensure that there is no ash deposit on the surface of the pipe, so that the boiler can operate efficiently and continuously. 4). Air supply system. 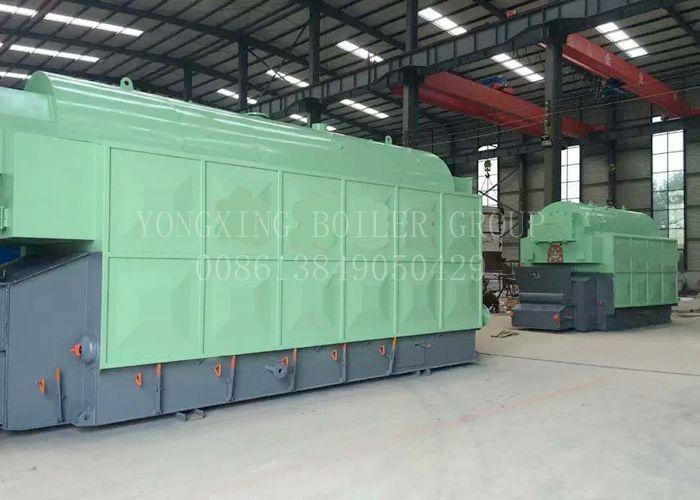 The boiler adopts the integrated arrangement of the air supply system and the burner, and the air is sent to the furnace through the blower through the blower to achieve the function of conveying fuel and supporting combustion. 5). Leading dust removal system. Under the action of the induced draft fan, the high-temperature flue gas generated after the completion of the combustion passes through the convective heat transfer in the pipe to enter the dust collector for purification, and finally is discharged by the chimney through the induced draft fan. 6). Automatic control system. The control system adopts high-brightness and full-English display mode. The PLC control system is used as the central control unit. The main body of the boiler (mainly the upper body and the lower base) has been assembled in the factory. After the boiler auxiliary machine purchased by the user is in place, only the interfaces and auxiliary machines and piping systems can be completed. DZL series adopts light chain belt grate, with high degree of automation, equipped with dust removal equipment, less environmental pollution, and has good comprehensive economic and technical indicators, which are well received by consumers. 1). Before starting the boiler, check the power supply, voltage, water source, fuel abnormality, close the drain valve, open the water supply valve, and check whether the flue is unobstructed. In addition, check the pressure of the furnace body and the operation of the make-up pump to confirm whether the motor can work normally. Check the working status of the pump. After all the above devices have been confirmed, they can be turned on. 2). When the user repairs the boiler or replaces the accessories, the power must be cut off to avoid danger to the operator. 3). The electric control box, burner, pump motor and other parts should be protected from moisture ingress to prevent burning, and the boiler should be kept clean. 4). This product belongs to biomass/fired steam boiler. Please be sure to install water softener when using this equipment according to the boiler water quality requirements. Because the hard water quality will cause boiler fouling, it will cause tube bursting when it is serious. Shorten the life of the boiler. Failure to use the water treatment equipment as required to cause damage to the boiler is not covered by the warranty. 5). Please pay attention to the timed sewage when using the steam boiler. Discharge at least once a day and discharge at a pressure of 0.15 MPa to 0.25 MPa. This can effectively prevent pipe blockage. In addition, the sewage pipe should be connected according to the regulations, beware of the operator's burns. 4. The parameters comparison of different common fuels is as follows. According to the table, it is obviously that the renewable fuel is a good choice for users. Kindly send us your inquiry by website or by mailbox.